Comment: Remodel front door patio area - approx 52 sq/ft. Take up old concrete/stone and replace with something a whole lot better and nicer looking (which wouldnât take much to do!). Comment: Original home builder installed railroad tie style wall with no "dead men" tie backs, and it has been slowly rotating and failing. Run-off water from the next door neighbor's property, and storm water from the street are the main problems. I would like a proposal also for trenching / installing an overflow culvert above the wall filled with large river stones to help stop massive erosion. 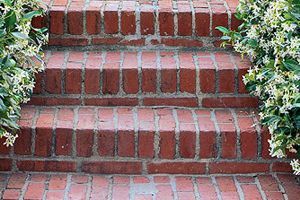 Comment: I would like to have my stone work on the stairs (part cement and part stone presently) and outside entry to my home and some stone work on the side of my house repaired or replaced. Comment: I would like to get an estimate for a brick retaining wall that runs across the driveway that needs to be repaired. Some of the bricks are falling off and has some cracks. Roswell Brick & Stone Masonry Contractors are rated 4.82 out of 5 based on 864 reviews of 46 pros. Not Looking for Brick & Stone Contractors in Roswell, GA?